For the next ten weeks, Interfaith will be welcoming students from CSU San Marcos to our Betty and Melvin Cohn Center headquarters for a program called Operation Art. 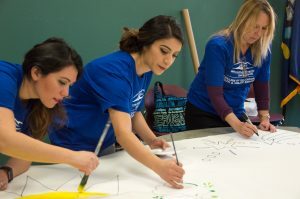 Operation Art, an art-healing project aimed at helping homeless veterans, debuted last spring as CSUSM professor Eliza Bigham and Marilyn Huerta, CSUSM communications specialist, worked with three of Bigham’s human development students to facilitate sessions at Interfaith’s Hawthorne Veteran and Family Resource Center on Friday mornings for six weeks. This semester, the students are working at Interfaith’s headquarters with the veteran residents in our Merle’s Place shelter. 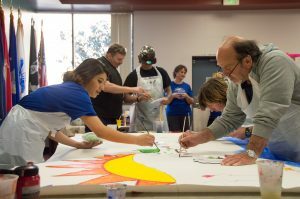 Operation Art sessions typically begin with work on a group mural painting, which acts as an icebreaker between the students and the clients. Other individual art projects have included mask painting, friendship bracelets, drawing and even utilizing coloring books. Interfaith is looking forward to seeing what the students can accomplish with our clients in the upcoming months and anticipates it to be another successful semester! If you are interested in bringing your school, club, business, or community group to Interfaith for your own unique volunteer opportunity, please contact Micki Hickox via email or by calling (760) 489-6380 ext. 204.